A fun escape from the winter doldrums. The temperature’s about to plunge again (goodbye, Fake Spring! ), so if you need a fun read set in sunny LA to bring you out of the winter doldrums, may I recommend The Proposal by Jasmine Guillory (2018; 325 pages)? 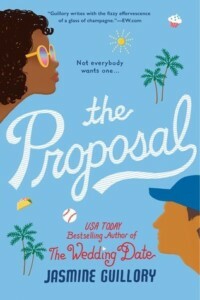 Nik is at a baseball game with her boyfriend of 5 months when disaster strikes: she looks up at the Jumbrotron screen and her boyfriend Fisher is proposing to her. After 5 MONTHS! And he’s MISSPELLED HER NAME. Nik rejects him in front of the entire stadium and he storms off. Just as the media starts to swoop in, Carlos and his sister Angela (who had been watching the fiasco from a few rows back) swoop in to save Nik from the cameramen. Grateful, Nik invites them to a bar to buy them a drink and starts to get to know Carlos a little better. They keep in touch and find out they like each other a lot. Neither of them are looking for a serious relationship, but as they continue to hang out, could this be growing into something more? This is just a fun, light read that’s perfect for escaping the winter blues. I really loved both Nik and Carlos as characters – Nik is determined to take care of herself and Carlos is determined to take care of his family after the unexpected death of his father five years ago. The LA setting is lifelike with lots of details about the food they’re eating and the different neighborhoods they go to – a fun armchair vacation. It’s a little bit steamy, but mostly cut-away physical romance (All About Romance gives it a “Warm” sensuality rating). Bonus: this book was just chosen as Reese Witherspoon’s book club choice for February! Also available on e-book via Overdrive. Put a hold on it today or visit the library and check our Lucky Duck books – there might be a copy waiting there for you! The Hating Game by Sally Thorne (2016; 374 pages). Lucy and Joshua, both assistants to high-level executives at their company, hate each other. Not dislike. Hate. But after their companies merged, they have to work together. They’re both up for the same promotion and tensions are running high. But as they battle for recognition, Lucy is discovering that maybe she doesn’t hate Joshua. And maybe he doesn’t hate her. Or maybe it’s all just a game.